Mark Gerdemann holds a garbage bag while Jack Fleming tosses some trash into the bag as part of a downtown Lima cleanup, Sunday. LIMA — More than 100 people gathered in Lima’s town square Sunday to help clean up the downtown. The cleanup was an effort of Lima Clean. “We have noticed, once the snow melted that there was litter everywhere and I decided to do something about it one day. And three weeks later, this is what we have,” said Rachel Hern, organizer of the cleanup. Volunteers from Lima area businesses and schools turned out to help. “We have some groups from 318. We have groups from CCR Realty, some groups from Fast Signs. We have a kindergarten class from Shawnee Elementary so we’re very excited to have them join us,” she said. Hern was pleased with the turnout. “It’s just mind-blowing that people want to come out and help and I think it really shows that there’s more good here in Lima than negativity,” she said. So what does Hern hope to accomplish through the cleanup, other than a cleaner downtown? “I hope to bring families together with a good event and show the younger generation that we can make a difference and make a change by cleaning up our city,” said Hern. Aubree Kaye, Downtown Lima executive director, was amazed. 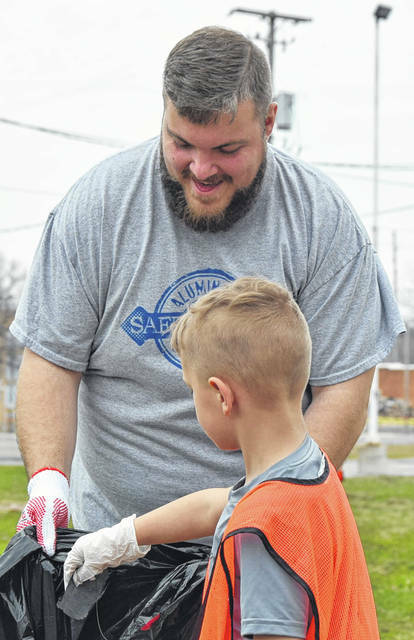 “It’s phenomenal to see this many people come out that care about the community to clean up the downtown as well as other parts of Lima. She’s attracted families and kids and this is a learning experience for the children as well that you have to clean up your community to keep it clean and it makes everything look better,” said Kaye. Taking care of downtown properties is important. “We all do a little bit and it will make it clean and stay clean instead of seeing people throw garbage different places . It’s extremely important for the downtown to have a clean, great community space we can come in and have events and see people and just be having a great place to hang out,” said Kaye. https://www.limaohio.com/wp-content/uploads/sites/54/2019/04/web1_DowntownCleanup-toned.jpgMark Gerdemann holds a garbage bag while Jack Fleming tosses some trash into the bag as part of a downtown Lima cleanup, Sunday.